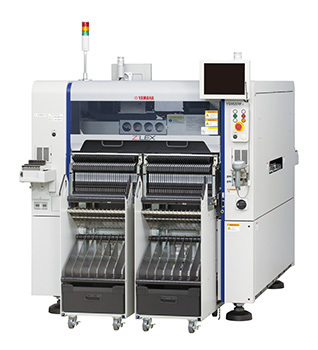 Yamaha Motor Launches Two New Surface Mounters, ∑-F8S High-speed Mounter with 5% Increased Effective Tact and Z:LEX YSM20W with Expanded PCB Adaptability - News Releases | Yamaha Motor Co., Ltd.
IWATA, January 7, 2016—Yamaha Motor Co., Ltd. (Tokyo:7272) announced today that two new surface mounters*1 will be launched in the first quarter of 2016. The premium modular Σ(Sigma)-F8S will be launched on April 1, and the high-efficiency modular Z:LEX YSM20W on February 1. The Σ-F8S, a new model of premium modular “Σ” series, is an evolutionary advancement of the Σ-F8. The existing model employs a rotary direct drive head to achieve 150,000 CPH*2 (in optimum conditions), the world’s fastest level. The Σ-F8S achieves an effective 5% tact improvement on average and greater productivity compared to the existing version, and with its improved mounting accuracy this new model is also capable of handling the extremely small-sized 0201 (0.25 x 0.125 mm) chip components. The second new model, the Z:LEX YSM20W, retains the flexibility and efficiency across a range of diverse production conditions and the same high-speed capability, component handling, and scalability as the high-efficiency Z:LEX YSM20 mounter. In addition, the Z:LEX YSM20W is a Z:LEX wide-body model that features significantly increased PCB adaptability, and which can handle up to extra-large-sized PCB's larger than L size*3, and larger than M size*3 PCB's in dual-lane production. The new Σ-F8S and the Z:LEX YSM20W will be on display at the 45th INTERNEPCON JAPAN trade show for electronics manufacturing and surface mount technology (SMT) to be held from January 13-15, 2016 at the Tokyo Big Sight (Ariake, Koto-ku, Tokyo). Surface mounters: Production equipment designed to mount various electrical components onto PCB's (Printed Circuit Boards), which are then incorporated into electronic products. CPH (Chips Per Hour): Total number of chips that can be mounted per hour (unit time). Indicates processing capability under various conditions. In recent years, miniaturization, high-densification, high functionality, and diversification as well as shortened product cycles have increasingly accelerated for a variety of products such as consumer electronics, personal computers, and mobile telephones. Along with faster speeds, flexibility in order to efficiently accommodate small-scale varied production up to mass production on the same line is required in electronic component mounting processing for the above types of products. In response to this, based on the popular high-performance existing model Σ-F8, the newly-developed Σ-F8S premium modular has achieved a new level with the addition of leading-edge technology including a lighter-weight axis drive system and new servo control technology. This new model now has an approximately 5% improved effective tact on average, as well as being capable of handling the extremely small-sized 0201 (0.25x 0.125 mm) chip components. A new edition in the Z:LEX series, the YSM20W, provides flexibility and efficiency in various forms of production without the need for replacing the head thanks to the "1 head-solution" concept. This new model is a wide-body version of the Z:LEX YSM20 universal modular, and it provides both high-speed and versatility at a high level. It is now capable of handling extra-large-sized PCB's for automotive products, industrial, medical, power devices, and LED lighting etc. with its significantly increased adaptability to PCB sizes and weight. In addition to this, the dual-lane specification provides benefits from mass production in dual-lane production with its ability to handle not only small mobile device type small PCB work, but also PCB's at larger than M sizes. From mass high-speed production to highly-versatile multi-product capable production comes a complete surface mounter line-up that meets the changing needs of the market. 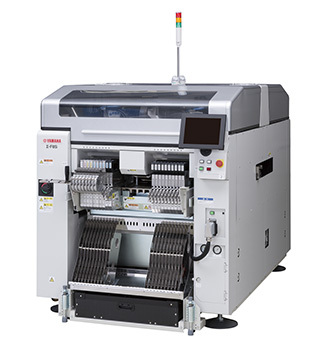 Here, Yamaha Motor takes advantage of its full line-up of surface mounters, solder paste printing equipment, dispensers, and testing systems etc. to achieve improvements in quality and efficiency for production in all types of products through total line-up solutions that build synergies between mounting line equipment. Introduction of leading-edge control technology together with the adoption of an off-set type linear motor through a logic-based design revision of the XY drive axes. The supporting beam of the head has been made more lightweight and with reduced vibration. Because of this, the effective tact delivers a 5% productivity improvement on average over existing models. At the same time, mounting accuracy of ± 25μm (3σ), which corresponds to handling the extremely small-sized 0201 chip components, has also been achieved. Compatibility of the main options with the current model Σ-F8 has been maintained, including with the head, nozzle, nozzle stocker, and tape feeder. This allows for users of the current Σ series to continue to use their specialized equipment as they implement this new equipment hassle free. Handles a maximum PCB width of up to 356 mm where the same width PCB is being conveyed at the front and rear while in dual-lane specification mode. In this case, the head will continue to function without front or rear head strike for up to a maximum PCB width of 324 mm achieving high-efficiency implementation without loss. In single-lane specification mode, PCBs can be conveyed at up to a maximum length of 810 mm, maximum width 742 mm, a conveyable weight of up to 10 kg, and a thickness of up to 8 mm. This new model is also compatible with a wide range of extra-large-sized PCB's and jig conveyance etc., including for automotive products, industrial, medical, power devices, and LED lighting.